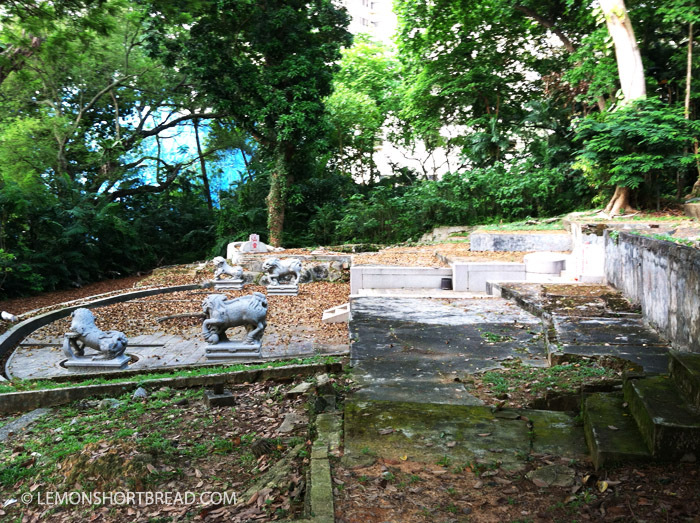 Decided to take a quick exploration of the Tan Tock Seng grave site at Outram Road because I passed by it the other day. 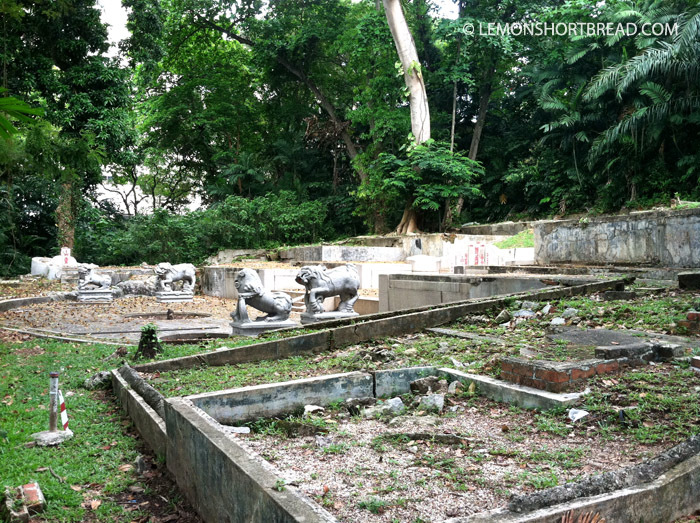 I've never knew of its existence since Tiong Bahru isn't part of my vicinity and the site piqued my interest because one of the graves was pretty large and facing the road. Spotted it while crossing the overhead bridge towards the bus-stop opposite Tan Boon Liat building (Tan Boon Liat is the great-grandson of Tan Tock Seng). 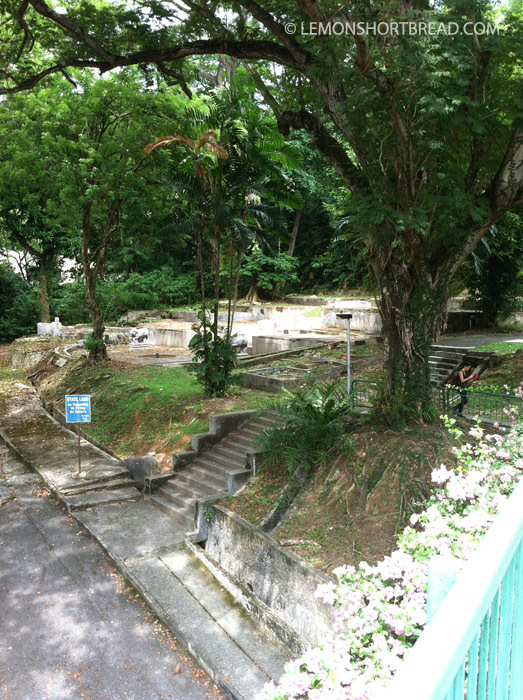 Tan Tock Seng (1798-1850) was a merchant and philanthropist in Singapore, and became of the wealthiest settlers here. 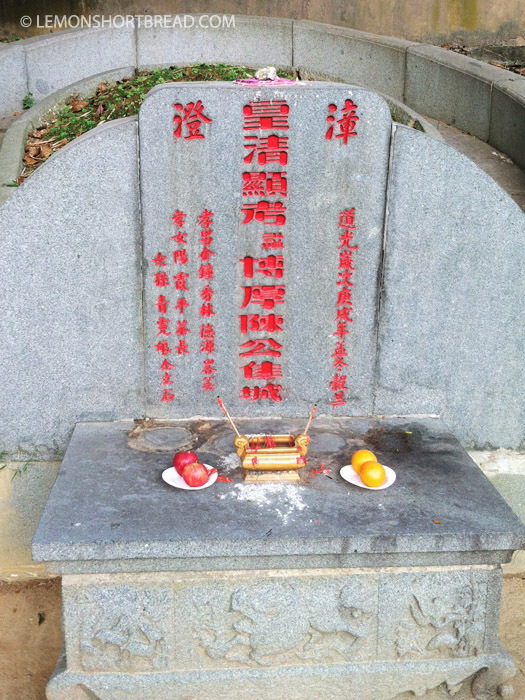 He was made Justice of the Peace and also contributed funds to the building of Tan Tock Seng hospital. Here is a board introducing the site. You can read it by using the 'View Image' on right-click to view it in 1000pixels. There is a sign that warned 'STATE LAND NO TRESPASSING'. National Heritage Board says you can follow the trail. 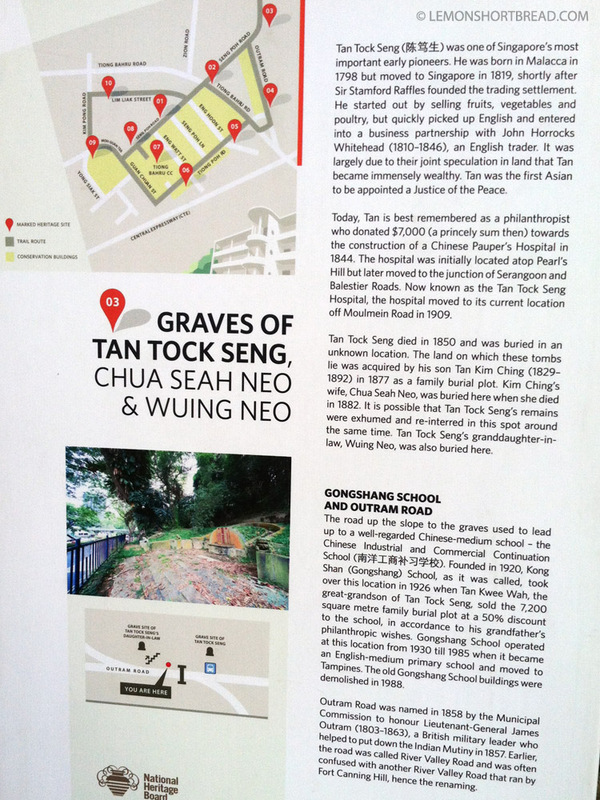 This is the grave of Tan Tock Seng's daughter-in-law Chua Seah Neo, and granddaughter-in-law Wuing Neo. 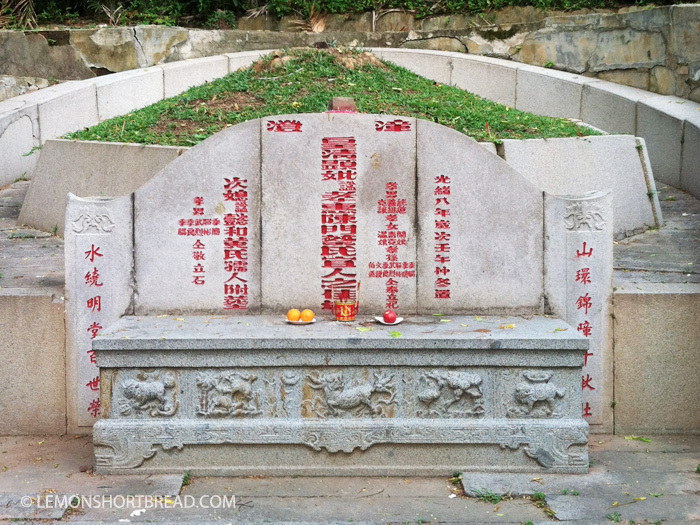 It is more elaborate than Tan Tock Seng's grave. It is dated 1882 and looks pretty spruced up and scrubbed clean, apart from the fallen leaves. 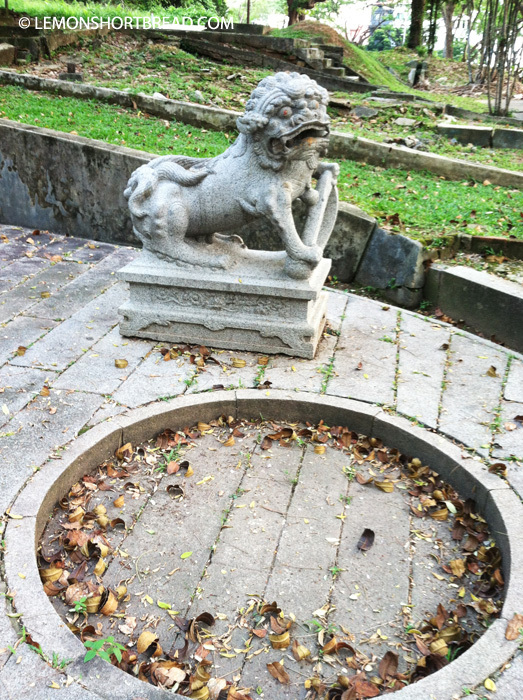 This circle appears to be for collecting water when it rains, possibly for fengshui. There is a larger one in the center in the photo above. There is a shrine for a mountain deity. I'm not too sure about the customs of it but guessing because the family plot is situated on a hill. 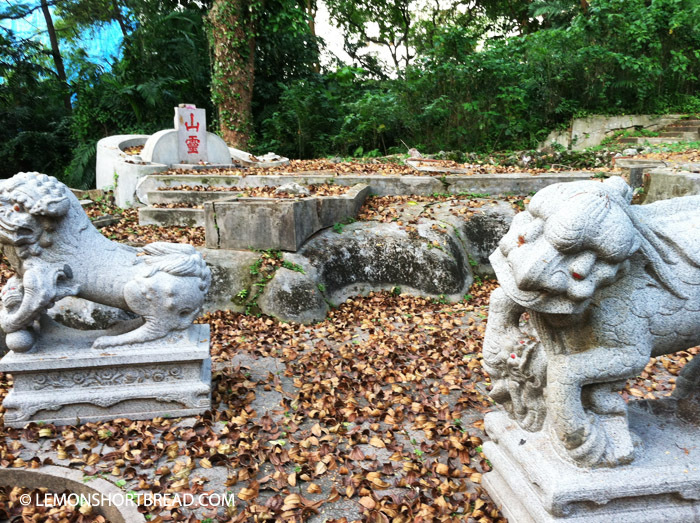 The stone guardians are interesting, can't tell what the one on the right is, maybe it is a hybrid chinese chimera (qilin or pixiu?) but it has hooves. 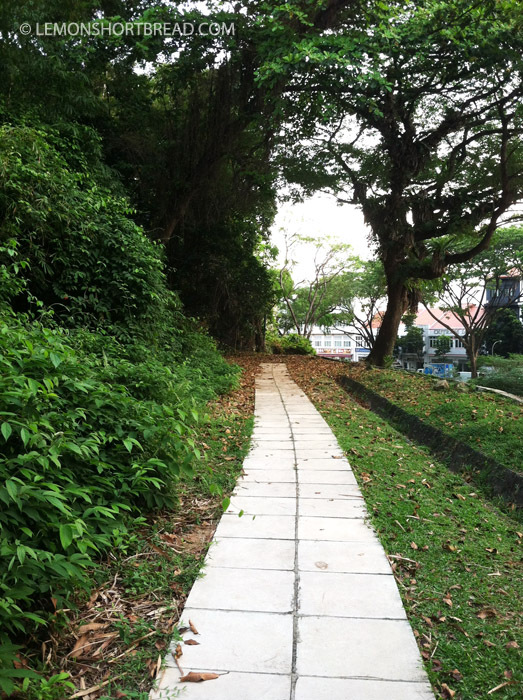 There is a path going towards Tan Tock Seng's grave towards the right, located on a hill running along the main road. 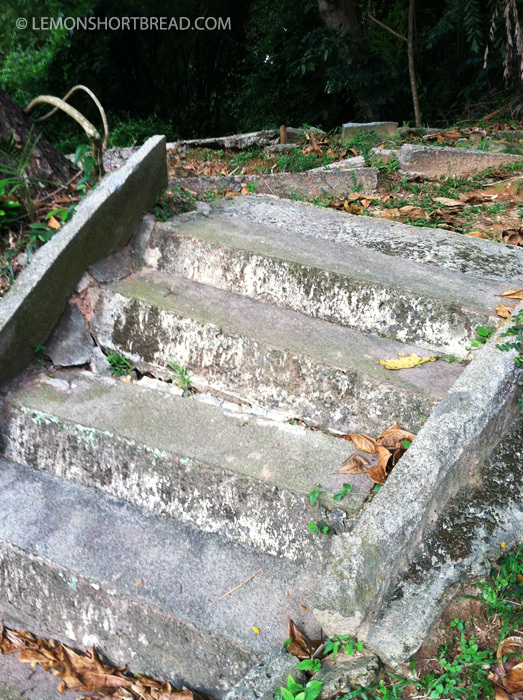 Down a slanted stone stairs. 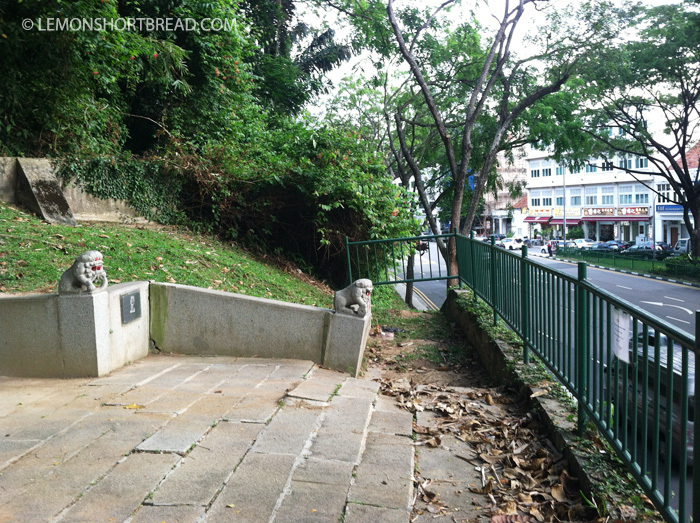 Here is Tan Tock Seng's grave, they cleaned it up pretty well. Seems like someone was here not too long ago too. 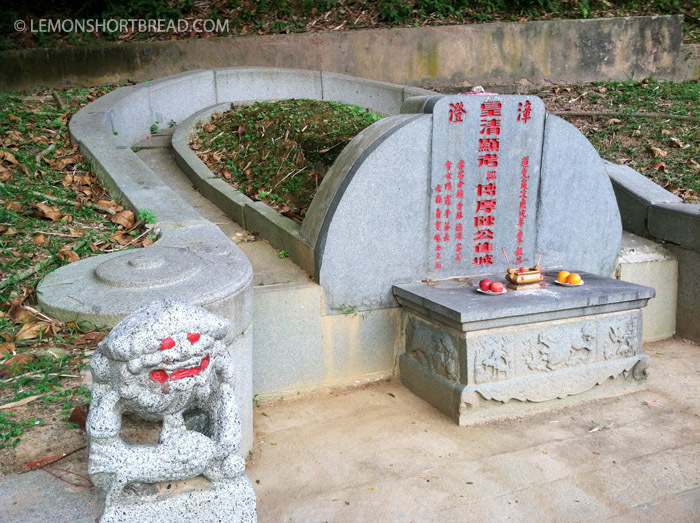 It is much smaller and simpler than the other grave, his remains were originally not buried here but re-interred later. See it is just above the bus-stop! 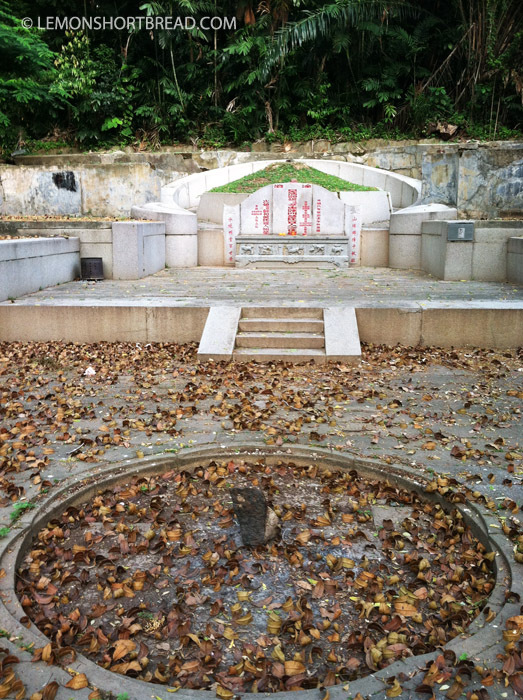 Beyond that stone lion there is another mountain deity shrine. After that, it is a dead end. It was getting dark and the mozzies were probably hungry so I left after snapping a few shots.